With EverTrue's Facebook integration, we monitor constituent engagements with your institution's public Facebook pages. Through monitoring these engagements, we are able to capture constituent's Facebook profiles and link them to their EverTrue record, recording every one of their engagements. How do we do this? Any Facebook profile that has engaged with a post from one of those monitored pages will be available for automatic and manual matching. If the Facebook profile has not engaged with a piece of content, we will not be able to link their Facebook profile at this time. Additionally, simply "liking" a monitored page does not count as post engagement. 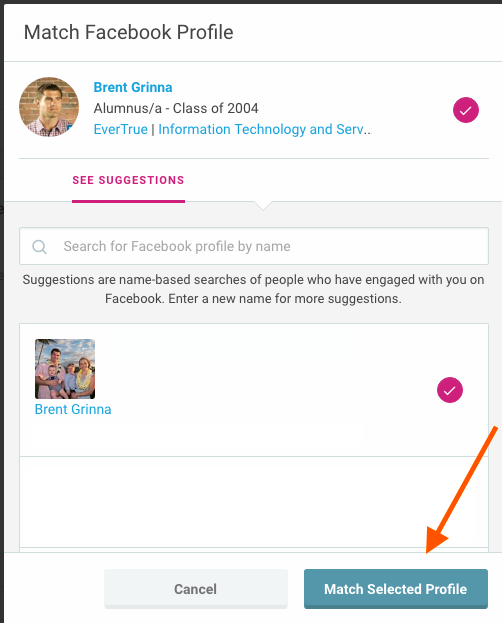 Using the constituent's imported name from your institution's database and the names of engaged Facebook profiles, EverTrue attempts to make an automatic one-to-one match between a constituent record and a Facebook profile. Because automatic Facebook matching is based on unique name matches, we are more conservative on our auto-matching. E.g. If you have more than one John Smith in your database, we will be unable to make an automatic match. Additionally, if there are two engaged Facebook profiles with the same name, we are likely to hold back on auto-matching either one of those profiles to prevent inaccurate results. In the case where an incorrect Facebook match was made and you're looking to un-match that profile, click here. Facebook matches are created based on a constituent's name. All matches come directly from constituents who have engaged with post content on any of your institution's public Facebook pages being brought into EverTrue. 1. On any un-matched profile, open the "Actions..." dropdown menu in the top right of the profile and select "Match on Facebook". There are also several other places on a profile where you can match to Facebook - the Facebook icon near the constituent's name, the "Match on Facebook" button at the bottom of the Summary >> Bio section in View All mode, or under Engagement >> Recent Facebook Posts. 2. Once you have selected "Match on Facebook," we will display some suggested profiles for matching. Suggestions are name-based searches of people who have engaged with your Facebook Page(s).These individuals have engaged with your Facebook Page(s) at least once, but we were unable to make a definitive automatic match to a single constituent. If you don't immediately see who you are looking for, try typing in a version of their name (e.g. nickname) to generate new search results. If you still can't find the constituent's Facebook profile, they may not have engaged with any monitored content. At this time, EverTrue only allows Facebook matches to profiles who have engaged with a piece of content. 3. To confirm that a suggested match is the correct person, click on the suggested name to be directed to their Facebook profile. 4. Once confirmed, select the constituent and click “Match Selected Profile” to create the match!